A former student and colleague of Jane Goodall shares stories of chimps and their heroes, and takes readers on a journey to save man’s closest relative. Unbeknownst to much of the public, chimps are in trouble: censuses show them to be extinct in four African countries and nearly so in ten others. A large percentage of the remaining populations live in unprotected, increasingly fragmented forests. When Nancy Merrick learned these startling facts in 2009, she decided it was past time to discover the extent to which chimpanzees are at risk across Africa and what can be done. Merrick had begun working with primates in 1972 as a young field assistant in Jane Goodall’s famous Gombe camp. Like the rest of the world at the time, she was swept up in the excitement of discovering the remarkable world of chimpanzees—their ability to fashion tools, their dazzling intelligence, and their complex relationships and societies. From that moment on, her human-centered worldview shifted, and she became a devoted advocate for our closest genetic relatives. When Merrick returns to Africa decades later, she’s alarmed by how much has changed. Human activity, such as agriculture and logging, has encroached on natural habitats throughout equatorial Africa, endangering chimpanzees, gorillas, and bonobos. In an effort to understand what we can do to save great apes, Merrick connects with primatologists and conservationists who are trying to protect the last great forests. Visits to some of Africa’s parks, sanctuaries, and expanding agricultural areas reveal the urgency of the problems and the inspiration of the people leading the search for solutions. Along the way, Merrick demonstrates that the best hope for chimps and other great apes lies in connecting conservation to humanitarian efforts, ensuring a healthy future for animals and humans alike. 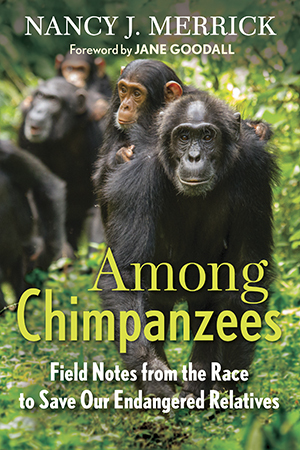 Among Chimpanzees is at once an inspiring chronicle of Merrick’s personal search to learn how chimps are faring across Africa and in captivity, a crucial eyewitness account of a very critical period in their existence, and a rousing call for us to join the efforts to be a voice for the chimpanzees, before it’s too late. An informative Q&A with Nancy Merrick is on the Sierra Club's "Green Life" blog.